$1250. 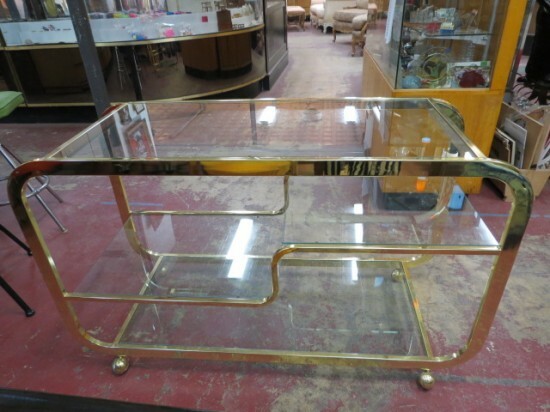 Vintage mid century modern Milo Baughman brass and glass bar cart/server, c. 1960. Milo Baughman was an American furniture designer known for his forward-thinking and distinctive pieces. Baughman designed for Mode Furniture, The Inco Company, Pacific Iron, Murray Furniture of Winchendon, Arch Gordon, George Kovacs, Henredon and Drexel, and more. Beautiful brass bar cart with curved sides and curved tiered shelves in the center. Brass wheels. 4 glass shelves. Perfect for your next party. Excellent condition. 46in wide, 18in deep, 28in tall.